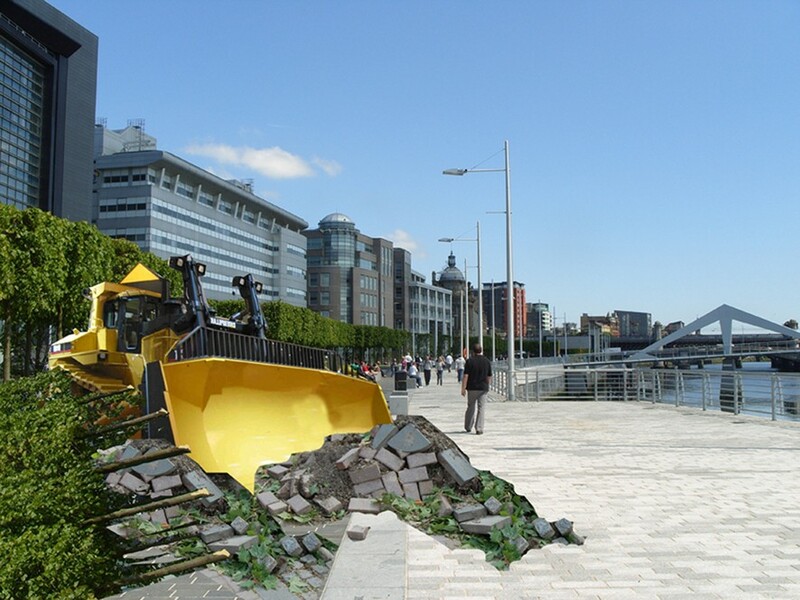 A campaign group has been set up to protest against controversial plans to redevelop the Broomielaw waterfront following approval by Glasgow City Council. It will see £7.7m worth of public realm improvements instigated in 2009 torn up to make way for four pods accommodating 32,000sq/ft of restaurant/café space and an enclosed winter garden. A lunchtime protest is being organised by the New Glasgow Society for Thursday November 24 between 12 and 2pm to galvanise opposition to the plans. The Society said: “This public space is set to be privatised with four brutish and disproportionate buildings encompassing the majority of this beautiful public realm. Inside these buildings an array of generic coffee shops and likely multi-national eateries will be installed to take your cash and deprive Glasgow's city centre workers of a rare pleasant outdoor space to relax and enjoy a picnic. The GD Lodge designed scheme is scheduled to commence on site in early 2012. The New Glasgow Society have described GD Lodge's scheme as "predictable, unoriginal and underwhelming"
"deprive Glasgow's city centre workers of a rare pleasant outdoor space to relax and enjoy a picnic": get a bloody grip. A winter garden is a great idea in a country obsessed with wanting to enjoy al fresco dining despite the fact WE DON’T HAVE THE CLIMATE FOR IT!! Since when do city workers go for “picnics” at lunch, since when do people plonk their arses down on hard landscaping for picnics, and since when did Glasgow not have pleasant outdoor spaces to relax in? You’ll never get a design that pleases everyone in these sort of high profile locations, but I for one can’t wait for some river front dining and leisure opportunities on the city side of the river. Also, these restaurants etc will be open in the evening, which is great in terms of introducing a bit of non-buckfast related activity post 'city' working hours. Yes, it’s a shame that some of the no doubt expensive public realm will be torn up, but the point of such interventions is usually to encourage investment, which in turn creates activity, jobs, and (hopefully) better places. This proposal (highly subjective opinions on design aside) appears to tick all the boxes and is a step in the right direction for Glasgow’s beleaguered water front, in my humble and carefully considered opinion. If we really must have something there, surely a lighter touch would be better? The 'pods' are pretty drastically heavy-handed and it's difficult to see how they could do anything but dominate and obstruct the waterfront. Jimbo - you are obviously entirely out of touch with what the river has, and needs, in this location. I walked past here yesterday lunchtime and there were many people, mainly office workers, out enjoying a picnic or 'outdoor packed lunch' - call it what you like. And this is November, not even the height of summer! These kind of successful public spaces shouldn't be swallowed up by the likes of another pizza hut / costa coffee or whatever it might be charging you for the pleasure of sitting in such a nice spot. The idea that Scotland "doesn't have the climate" to use outdoor space through the winter is silly. In Denmark they sit outside all through the winter in outdoor cafes- some of them even have those wee mini sleeping bag things attatched to the chairs to keep you warm. And even in France, its not exactly hot and sunny all year round all over- go to some of the towns around the alps, and they'll still be sitting about outside drinking coffee. I was down here the other day too and it seemed pretty well used, despite the low temperatures. I am a worker who lunches outside, a long as the rain stays off then getting outside at lunchtime can sometimes be the only daylight I see in winter months with shorter days. There are so many areas in Glasgow that could use money spent on them to create better places - I live in one! Not to mention the fact that so many restaurant and shop units are lying empty after going out of business - lets create the jobs here by encouraging new business to these spaces, not build something in an area that has already had millions invested in it. Come on - let's spread the regeneration about a bit and make all of Glasgow a better place to be, not just some. What a horrible situation this is . The city is sleepwalking into another set of urban accidents. . The IFSD was an opportunity to create a new vibrant city quarter adjacent the Clyde. What we got was the mono-use clunky , squat boxes of faceless corporate floorplates we see today . No active frontage , not much life after 5:30. This I think is the real scandal. The clunky squat boxes of this proposal are a sticking plaster which should never have been needed in the first place . Pavilions in a linear park is a sound urban design aspiration but in their current form offer up a vision of that mirrors the anonymous corporate culture that forms their backdrop. They are ugly .cant it be redesigned. Neil C, I agree. J-Bob, rain rain and more rain. Cold and dry fine but we are facing climate change with even more wet weather. We have lost our outdoor culture. This is just typical of any Council. The 8 Million which was spent a couple of years ago would best be flung in the Clyde. Wait that's exactly what they fluid do with the materials, we could make dam and we could walk across it to get to the south side. Excellent we fluid then demolish the bridge as it would be surplus to requirement. In this climate we need jobs and developments are good. However when this is built it will be no Field of Dreams. Can we realistically see people walk to this development from the city centre. Come on spend the money elsewhere. Oh Glasgow, you just never learn do you? Custom House Quay proposals - FAIL! Tradeston waterfront proposals - FAIL! Well let’s face it. Do you ever go there without a car? Rarely. 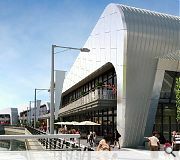 There is just no connection with other riverfront developments. The worst part of this project is the 8ft steel fencing that goes across the public walkway along the river which says “Private Land No Public Access!” No public through walkway along the river – Major Fail. Ok, this bridge great for driving and walking over but there is NO riverside walkway under bridge on the south side! Pacific quay - "The Hub" - FAIL! Dead space with no public amenities. Could we have a more cold and depressing building on the waterfront? Oh wait we could the Pacific quay - BBC Scotland - FAIL! Of course, in all of these projects there are positives. Theres no denying that. However, not one project has a correlation to the city, the river or the adjacent developments other than geographical location. Actually not one single development does anything with the river. Any of the waterfront developments thus far could have been designed inland. What does that say for the architecture of the Clyde? This is what Glasgow does. It sells out. It has already ruined the river and yet it continues to desecrate the last remaining piece of dignity that the once glorious Clyde has. For 3 years I ate my lunch at the Broomielaw nearly every lunchtime. Even on a cold winter day, it was one of the most tranquil places in the city to sit. Although, I think anyone who worked down that way will tell you it lacked strong public function - somewhere to buy a coffee and a sandwich or sit and have a quiet beer with friends on a warm summers evening. So yes, we can maybe agree, let’s put some small public function on the Broomielaw, but why destroy it? One major issue I have is why this approved without consulting the public? The council standard reply is that the documents have been on display in the council offices for months and the neighbours have been notified. In this instance that is just not good enough. The neighbours of this land are the citizens of Glasgow. Tell us about it! Don’t try and do the minimum work possible and try to sneak it through hoping no one will object. Here we are now, having to challenge the Council’s decision after they have made it rather than allowing us to inform their decision in the first place. Although I honestly believe Glasgow’s Planning Department will never treat the Clyde with the respect that it deserves nor do I think the Planners will ever listen to the wishes of its citizens over the financial incentives of the private developer, I think at least we have to try to show what Glasgow is missing out on having. I feel sorry for the Clyde. I feel pity for the City. Most of all, I am ashamed of the short sightedness of our generation. The Clyde gave us life. It created Glasgow. It is Glasgow. Shame on us all for allowing this to happen to our river and more so shame on the developers who stand ignorantly laughing at us all whilst spitting in the face of our once beautiful river. We need to present Glasgow City Council with visuals of what they could have. A design competition is one strong idea, but what’s easier is to show precedent. Prove to them that with previous examples that with little subtle interventions on the public waterfront, we can create a liveable, lively waterfront that we can all be proud of. One example, Bonhomme Pavilion in Maastricht along the Maas river. Simple Pavilion Cafe on historical riverfront very similar to Glasgow’s. This is a subtle, 1 storey small scale cafe, with a lot of public landscaping surrounding it. Ideal to fit into the existing landscaping which Broomielaw already boasts. The rivers should be the highest priority and should not be disregarded to make way for high profitable architecture which has no interest in relating to its fortunate context. "The big question is whether this change will be one we are proud to have been part of or one that will make our grandchildren curse us for being a bunch of greedy short-sighted fools who ruined their river." Good luck with the campaign, I hope the Clyde will get the respect what it deserves. Gordon - many thanks for your words of support. Also - a quick ideas competition is being launched on Thursday. Watch savebroomielaw.org for further details. ... great comment from gordon too, meant to say. nail on head. Conventional building practice will be unacceptable - precedents that demonstrate exceptional quality [of finish and construction] for such waterfront interventions should be investigated. The holes in the roofs for plant areas are lacking a perimeter of roofing surface on their north and south edges – this must be rectified [with about at least 1 to 3 feet or so in from the roof footprint] so that the holes do not sever the integrity of the forms when viewed from the neighbouring IFSD office blocks. However, before I’d begin thinking about endorsing the scheme, it needs the following final touch in addition to this rectification – as attention to neighbours’ views is paramount. Here goes: the strict rectilinearity of the holes should be reconsidered by gently splaying the north and south perimeter of the holes consecutively across the 4 pavilions, i.e. 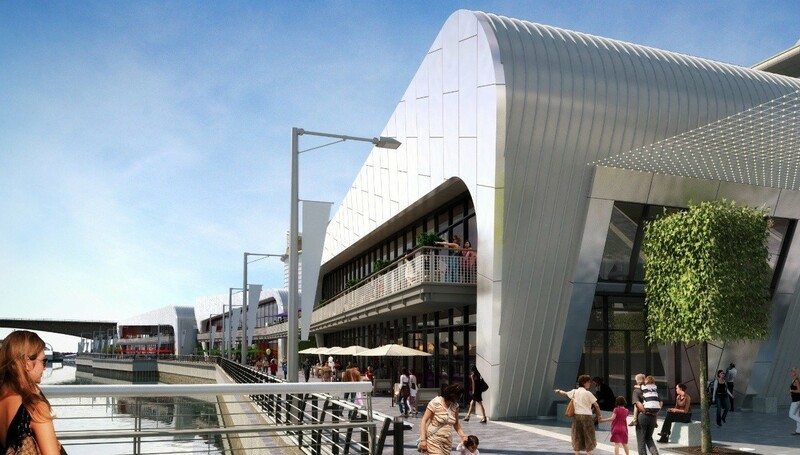 as already achieved in the skewing roof lines of the waterfront and Fast-lane elevations. This would make for a striking 5th elevation when viewed from above rather one that leaves unsightly left-overs. Why is this 5th elevation being ignored given the [good*] work done so far? *my opinion of course! Phasing may be prudent regarding possible letting difficulties. The history of the site from an image on the developer’s site flags up that it may be also prudent to consider giving the easternmost unit over to a ferry company to help support the strong civic realm that exists here. This would complete the spatial quality enclosed by the Central Stn bridges; the Broomielaw’ best architectural stretch; and finally the aforesaid presence of a public pavilion (best to be public as it’s a public urban space) on its western aspect, i.e. with the various planned eateries etc. following westward. I don’t believe that commercialism should dominate this western face. Best to track back to the signs of the past – i.e. to what was there before. Controversially, the architectural style, which is akin to the appearance of the backdrop IFSD buildings facing at the back of the Fast-lane is not to everyone’s taste. However, to me, the forms and their juxtaposition provide a satisfying perpetual visual flow along what would otherwise be an agitating experience along a curbed stretch of waterfront, if status quo forms were to applied instead – the forms marry well with the lines of the Kingston Bridge – looking west. The 5th elevation must be taken seriously as above to complete the architectural solution, and then the other reconsiderations would follow as bonuses. This would justify the investment put into the Fast-lane on the ground at the moment. The disruption and adaptation to the rather complete urban realm work to date is that it has successfully served as a catalyst for development, i.e. welcome [if not perfected] development if my above points are taken on board. Elegant bric-a-brac pods as pointed out by others can be added to this important public face before the pavilions are encountered! When I say public face, I mean an outpost on the public space that will serve the desire to take to the river once again - as previous generations did - by way of a public service that can offer this experience. The pavilions are simply an architectural solution that recognises the above potential of the urban realm by keeping its distance and thereby allowing such to happen. It will be the authorities remit to source the pod/s wanted, the ferry tenders and operators etc. not that of the developer’s of course. I should have pointed out earlier that it is the authorities that still have to do more to complete the bigger picture. I work on the Broomielaw. It needs something like this development - there is absolutely nothing here at the moment, except for offices! Some coffee shops and a winter garden would at least break up the monotony of the grey water and that odd dancing woman! This had made an already rushed comment appear even more rushed! With regard to my last comment, I see that the latest article on the subject has also used the word ‘pod’, but as a word to describe the pavilions proper rather than the hypothetical public additions to the pavilions that I was trying to describe. I used the word pods to describe the kinds of shells, call them what you like, that you might expect to see in addition to the commercial pavilions, such as the low key example shown by Tom above at http://static.panoramio.com/photos/original/18365842.jpg - I see pod as meaning understated and simply detailed shell not pavilion. I could also have used the words cabin hut shed booth stall compartment stand enclosure etc. The word pod is fine as an overarching design term. If an additional public function is ever to be conceived or embraced then I’d of course change the lingo to [e.g. ticket and information] office, centre, booth or the likes. I disagree that the ‘pod’ - or call it what you like - offers a model for the actual commercial pavilions, which are already seemingly fine, provided the 5th elevation doesn’t disappoint. The drawings that had shown the 5th elevation (i.e. the roof plans) appear to have been withdrawn from the developer’s website. The promise of “recessed plant areas on roof” needs to translate into “...will not affect the visual continuity of the forms when viewed from above”, and will hopefully conversely compliment the forms as mentioned in my 1st comment, as they hadn’t done so previously. Yes truly terrible design. Why does Glasgow not see the disaster that this is. The Broomielaw space at present is really well done. It looks sophisticated, spacious and European. I am not against riverside dining but what is being proposed looks terrible and cheapens the area. There are plenty other spaces alongside the river that could do with good designed eating areas why not choose them. The "disco", coloured lighting at night also looks so cheap - why doesn't Glasgow insist on the best of design. We have a chance of having the beginnings of a smart river front, which would enhance Glasgow instead I fear that we will end up with a riverfront that Europe would just laugh at! Please do not allow this substandard development to take place. Ah GD Lodge Architects using the copy paste tool to ruin the river...it was bad enough design but now I discover its a copy of an old design...they really pushed the imagination boat out for this one!